Council Member Tony Bokhoven is serving his second term on the Pella City Council. His service to the City dates back to 2006 when Tony was elected to the Pella Chamber of Commerce. He went on to serve as Vice President in 2007 and then as President of the Pella Chamber of Commerce in 2008. In 2007, Council Member Bokhoven was elected to his first term on the Pella City Council representing Ward four. Currently, he fills one of the two At-Large seats. Council Member Bokhoven is a lifelong Pella resident and graduate of the Pella Community School System. With a passion for entrepreneurship, he is a co-founder of the Pella Ice Cream Company and the President of a small freelance national television and radio motorsports broadcasting company. In addition, Council Member Bokhoven has been employed by Vermeer Corporation since 1997 and is currently the Lifecycle Solutions Training Manager. Council Member Bokhoven serves on the Board of Directors for the National Sprint Car Hall of Fame & Museum, a 501c3 Corporation, and is the past President of the Knoxville Racing Charitable Benevolent Organization. In addition, Council Member Bokhoven is involved in the Jeff Gordon Children’s Kick-It for Cancer foundation, an organization raising money for pediatric cancer research. Tony's current term expires January 1, 2020. 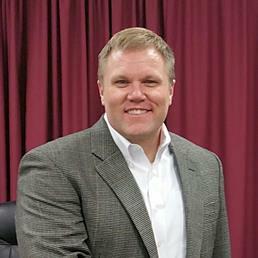 Council Member Bokhoven resides in Pella and in his spare time is an avid outdoorsman, enjoys biking and physical fitness activities, and holds his private pilot’s license. Council Member Bokhoven may be contacted by calling 641.628.3327 or by email.